Lake Dunn is the location of the swim course and the start of the MightyMite Triathlon. 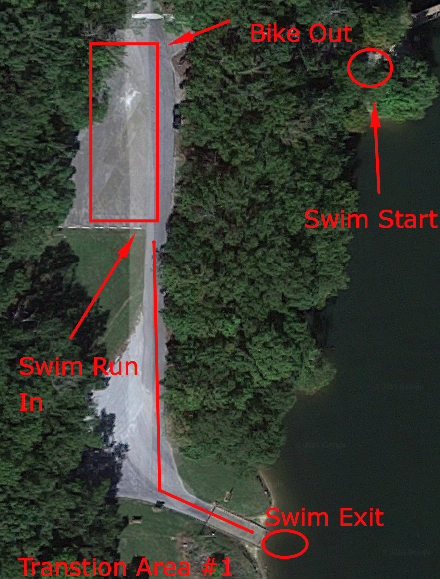 The looped swim course begins and finishes from the boat ramps at the swim/bike transition. As you exit the water, swimmers will start the 13-mile bike leg. 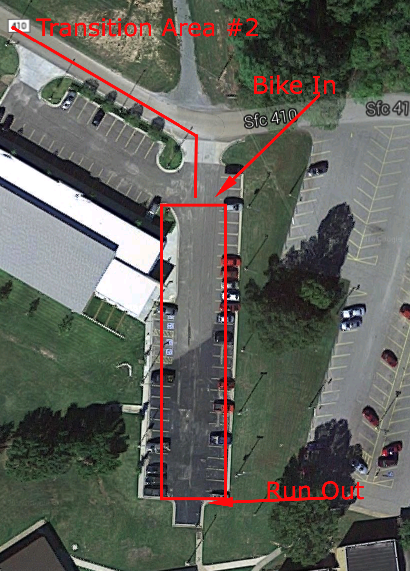 After you exit the water you will run up the hill to transition one, un-rack your bike, and walk to the bike mount area. Once on your bike you will start the bike portion with a downhill and sharp right hand turn. Use caution when negotiating this turn. You will bike around the parking area, which is flat until you take a right hand turn at the Visitor's Center, where you will encounter a short steep hill (ummpp!) During your recovery from that short climb you will take a left hand turn onto Highway 284/Newcastle Rd. You will go south on Highway 284 until you reach the East Arkansas Community College. Along the way on Highway 284 you will encounter one left hand turn at Highway 306. Spectators, relatives, and friends can take a right hand turn off of Highway 306 onto Highway 1 and go south to Forrest City for the race finish line, located at Dillard Ave. and Forrest. After you take a left hand turn off of Highway 284 into transition two at The East Arkansas Community College, you will dismount your bike at the dismount area and walk your bike to your rack. You will rack your bike and then proceed to start the final, running leg of the race. You will exit transition two and run through a portion of the college to a left hand turn onto Highway 284/Newcastle Rd. You will take Newcastle Rd. under Interstate 40 and over several small rolling hills to Arkansas Ave. Take a right hand turn. You will find flat terrain all the way to the finish line, but first you will need to take a quick left hand turn on Forrest and a right hand turn onto Dillard Ave.. You will then take a left hand turn onto Izard and another left hand turn on Hill Ave. You will take a left hand turn on Forrest and the finish line is in sight! Enjoy plenty of fluids and fresh Arkansas peaches for a job well done.